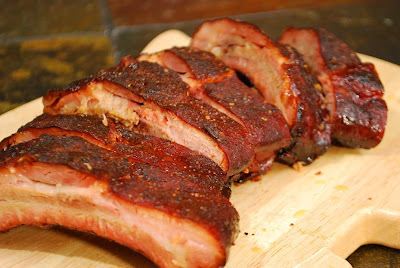 B) I'm not a huge fan of back ribs, I prefer St. Louis style trimmed spare ribs. 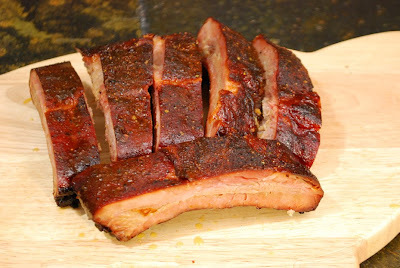 I smoked it on the Big Green Egg last night for lunch today and I used Chris Lilly's Memphis Style Dry Ribs recipe. He shared this recipe on the Today Show but it is part of his book Big Bob Gibson's BBQ Book, my favorite Q book this year. It's loaded with stories, recipes, techniques, and tips. If you need a last minute gift idea, I highly recommend it. It is appropriate for anyone from beginner to competitor. Remove the membrane from the back of the ribs. Combine the dry rub ingredients and mix well. 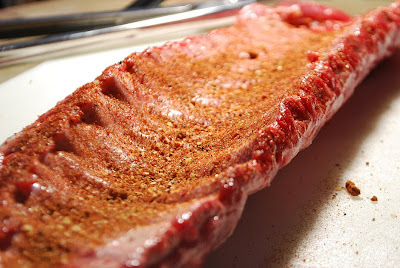 Reserve 1/3 cup of the dry rub, then apply the remaining rub generously to the front and back of the ribs. Pat gently to ensure the rub adheres to the meat. Build a fire (wood or combination of charcoal and wood) for indirect cooking by situating the coals on only one side of the grill, leaving the other side void. Preheat the charcoal grill to 250 F. Place the ribs meat side up on the grill and cook with indirect heat, with the grill closed, for 4 hours, or until the ribs are tender. Mix the vinegar with 1 cup of water in a shallow baking pan. Remove the ribs from the grill and dip them into the vinegar water. 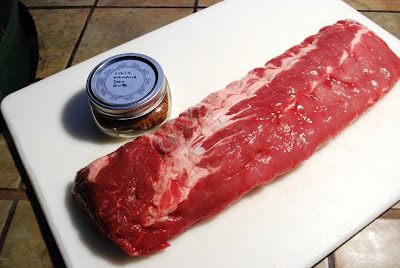 Remove the ribs from the wash and place them on a cutting board. Season the ribs immediately with a heavy coat of the reserved dry rub. Cut and serve. Membrane removed and rubbed on the back. 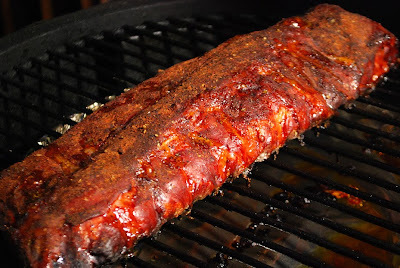 The only basting during the cook is from the ribs own juices. Cooked bone side down, I normally smoke mine bone side up. This went just shy of 5 hours at 250f. I used Kroger lump (which I would not buy again) and hickory chips. Sliced and ready to be packed away for lunch the next day. I might have snuck one rib - for quality control purposes of course! Not bad for loin back ribs. One or two at the small end were fall off the bone (which is overcooked), but the rest were cooked right and pulled clean off with each bite.